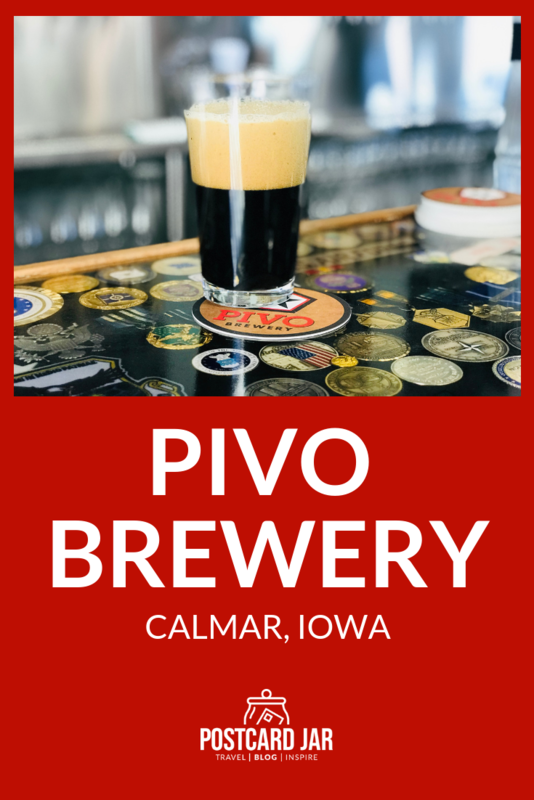 When we sat down at Pivo Brewery, in tiny Calmar, Iowa, I was excited to taste a few craft beers at this new tap room. Then, owner Craig Neuzil came over to my table with eight (!) beers in sampling glasses. I was sure I’d told him it would just be me doing the sampling, and that Ann was planning to just take pictures and do the driving on our daylong tour though craft beer country. But no, they were all for me. Craig assured me they were all small pours and I could handle it. 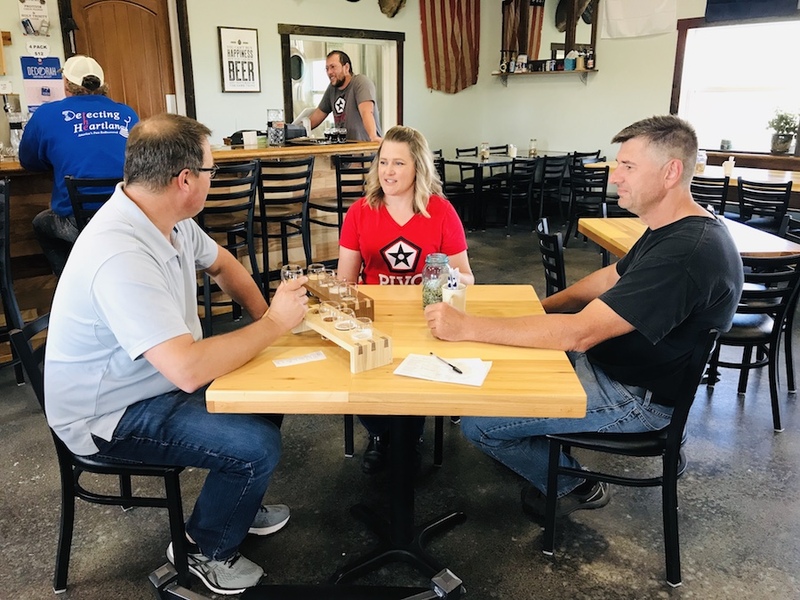 Steve samples beers while chatting with owners Sara and Craig in the tap room of Pivo Brewery. 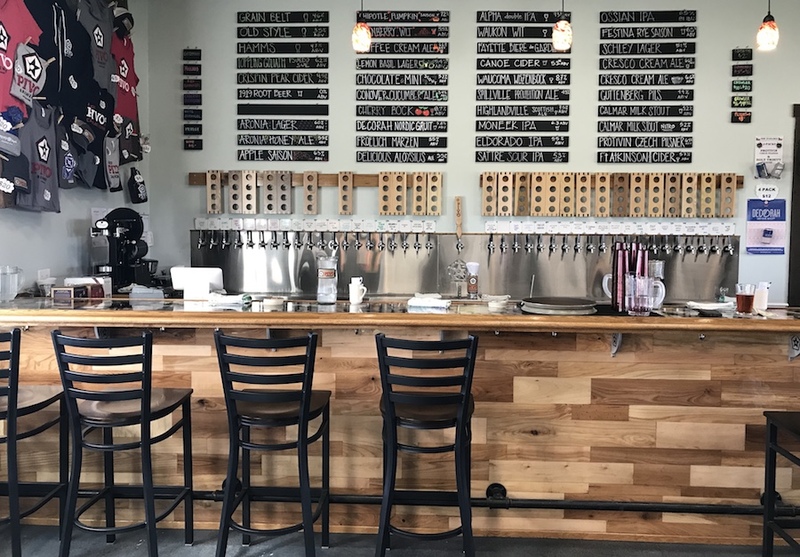 When researching Decorah for our tour of northeast Iowa this fall, we learned that the area has a fast-growing craft beer scene anchored by the success of Toppling Goliath and including local favorites like Pulpit Rock and the new Pivo Brewery. I told Ann we should definitely check it out because our readers like it when we make sacrifices for them in the name of research. Ann rolled her eyes at me, but agreed that we should probably explore a little while we were there. Forty-one taps mean the tap room at Pivo Brewery has something for everyone. Our first stop was Pivo Brewery and Blepta Studios. 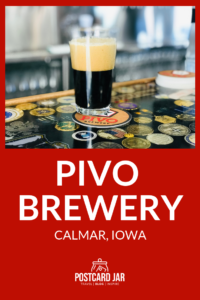 Having lived in Crete, Nebraska, with all its Czech heritage for the better part of two decades, I was excited because I knew that “Pivo” means beer in Czech. I felt prepared for this visit, like the kid who raises his hand in class and reminds the teacher there was supposed to be a quiz today. 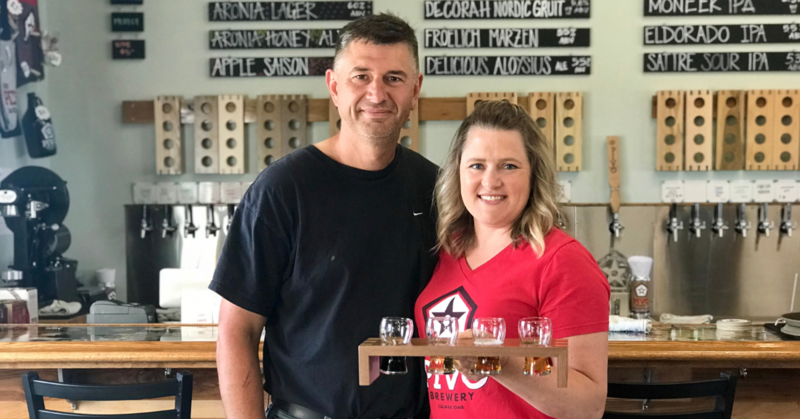 Owners Craig and Sara Neuzil returned home to northeast Iowa to build their dream after Craig spent 21 years serving in the United States Air Force. They settled in Calmar, Iowa, about 10 miles south of Decorah. A lover of craft beer, Craig wanted a state-of-the-art brewery where he could create unique brews featuring as many locally grown ingredients as possible. He followed his vision and now has a wonderful brewing facility and tap room with about 40 taps. Kegs attached to the tap system for the tap room at Pivo Brewery. 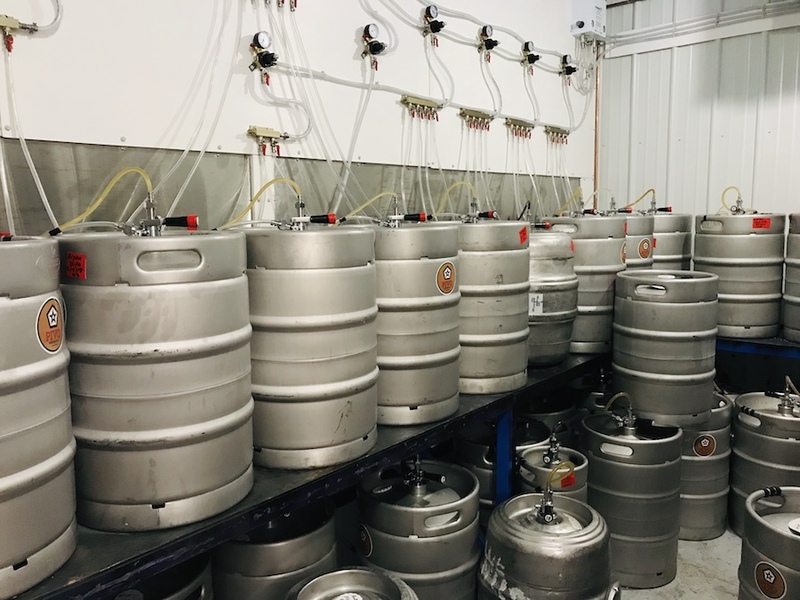 Each keg holds a different beer. Sara had a different dream. An artist, she wanted to create a beautiful, well-lit space where she, and others, could create art. So when they built their business, they kept her dream front and center, as well. Built on the second floor of the brewery, Blepta Studios has large windows, natural light, and beautiful views to inspire. The best part? Customers can use the studio to create art while sipping a beer from the brewery. What a fun idea for an outing with friends! Customer art from Blepta Studios. We asked Sara where the name Blepta came from. It turns out that it’s the name her Czech grandfather had for her when she was a little girl. Blepta means chatterbox. 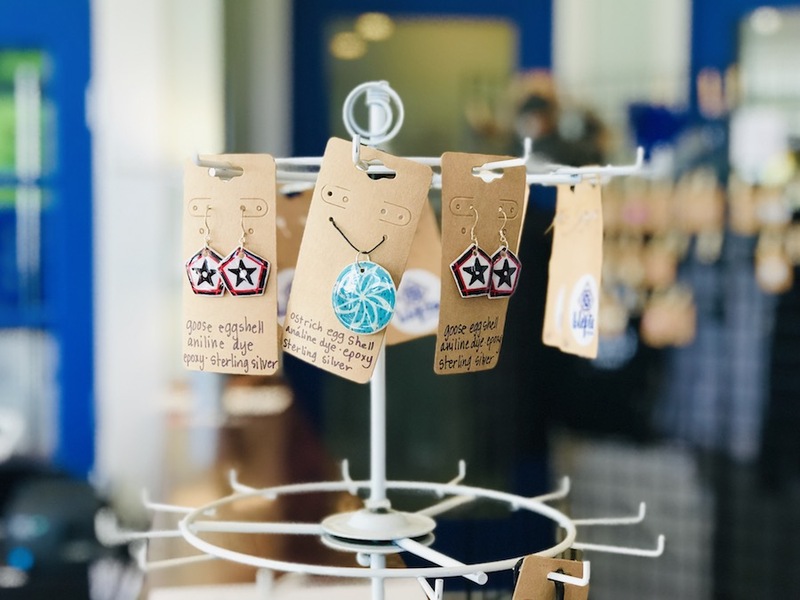 When the studio isn’t filled with customers, Sara can work on her own pieces that she sells. She specializes in coloring ostrich, goose, chicken, and duck eggs with a technique that uses dye to resist color on eggs. 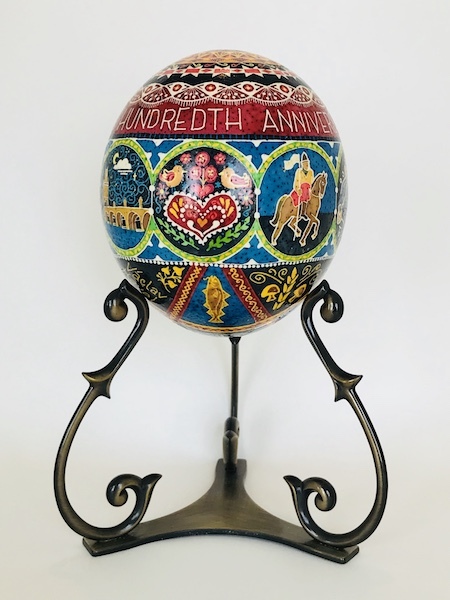 One of the eggs decorated by Sara Neuzil. 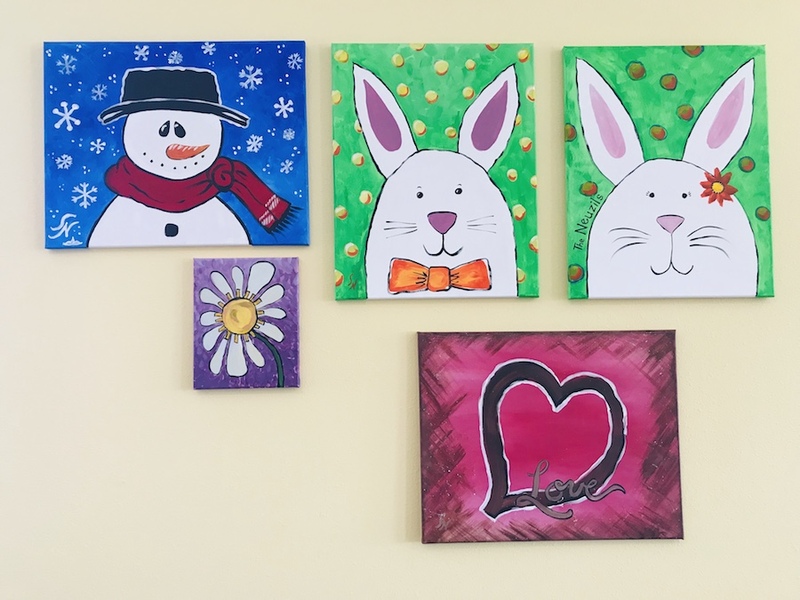 There is also a gift shop where you can purchase art and even some jewelry that Sara makes from the egg shells. You can buy art and even hand made jewelry in the gift shop. Back to the tap room. Using reclaimed wood and antique furniture along with some more modern touches, Craig and Sara put together this unique space. The decor here sets the tap room apart from others. In fact, you’ll never see another bar top quite like the one here which features things Craig picked up during his 21-year Air Force career. 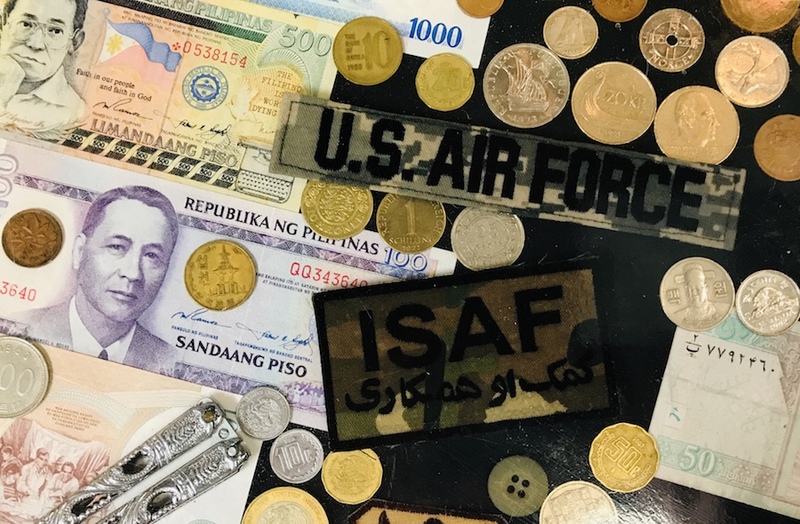 Check out foreign coins and bills as well as other souvenirs from Craig’s 21 years in the Air Force. 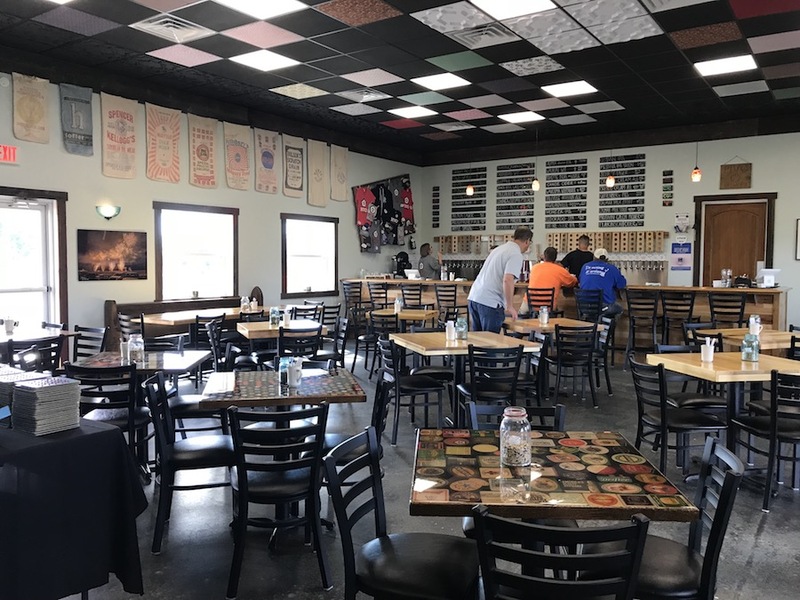 In the tap room you can sit, relax, enjoy a bite from the kitchen and savor one of about 40 beers on tap. The tap room at Pivo Brewery is uniquely decorated and features many local touches. On Wednesdays, you can even play bingo at one of the uniquely decorated tables. 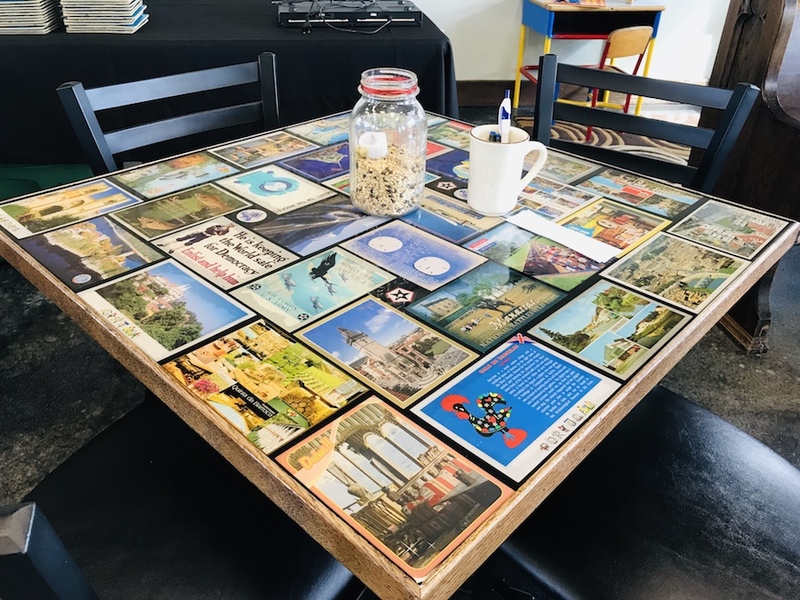 Of course, we loved this one decorated with postcards. One of the unique table tops Craig made for the tap room of Pivo Brewery. Using as many local ingredients as he can, including some he grows himself, Craig has created a portfolio of beers that definitely has something for everyone. From a hoppy Double IPA to a Cucumber Saison to traditional lagers, there is a wide variety of beers at Pivo Brewery. They even offer a beer brewed with coffee — and I have to say it was among my favorites. 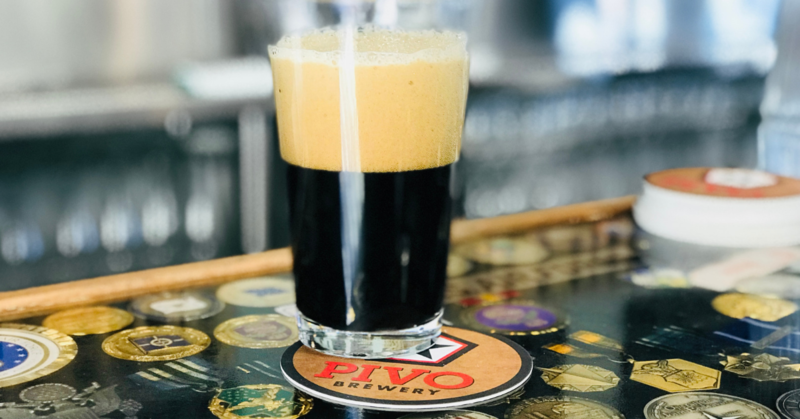 A rich, flavorful dark beer on the bar at Pivo Brewery. So when I sat down for my complimentary tasting expecting a traditional flight of four beers, I probably shouldn’t have been surprised when Craig brought eight. That may sound like a lot, but those beers represented less than 25% of what Pivo Brewery has on tap. Knowing that it was only me doing the tasting, Craig took it easy on me and only poured about a half glass of each. Still. Then, I started sampling, enjoying the unique flavor and characteristics of each beer. As I sipped, Craig explained his thinking behind the beer and how it was crafted. Can I just say that I love my job as a travel influencer? The Neuzils grow or buy high quality local ingredients whenever possible, and give spent grains to local farmers for feed. They turn around and buy meats from those same local farmers, keeping everything as close to home as they can. The operation is as clean and green as possible. Craig and Sara Neuzil stand in front of the bar in the taproom at Pivo Brewery. When it was time to go, I really didn’t want to leave. 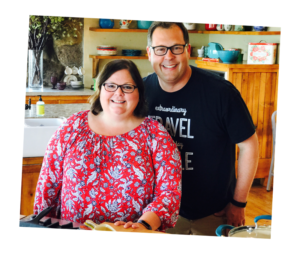 Craig and Sara’s hospitality and their love for their business is infectious. I can’t wait to return to Calmar one day to spend some quality time enjoying the hand crafted beer, and beer crafted art of Pivo Brewery and Blepta Studios. My beer tasting experience at Pivo Brewery was complimentary. The opinions expressed and the memories of delicious, well-crafted beer are my own. For driving directions and hours of operation, visit www.pivoblepta.com. Special thanks to Charlene Selbee for her help with our beer tour itinerary. Great brewery… It is unreal how many well crafted beers on tap. Usually that much diversity means all the beers usually suffer. The craftsmanship of Richard and Craig is impressive.